When Motorola initially offered the ATRIX without the lapdock for review, I declined, citing that the lapdock is a critical accessory to demonstrate the ATRIX unique selling point. After waiting a few weeks, the lapdock was available and I received the deluxe set including the HD Multimedia dock. And it was worth the wait. The docks certainly provide new perspectives in converged mobile computing. But before I talk about the usefulness of the docks, let me cover the ATRIX handset first. The Motorola ATRIX comes loaded with the following amazing specs, which speaks for themselves. 1930mAh battery, the largest battery capacity for a smartphone. 4-inch 960×540 qHD LCD display, the highest resolution screen for an Android phone. 1GHz dual-core, on par with the latest Android tablets, delivers pretty smooth performance, for instance, when scrolling. The power button doubles as a fingerprint scanner. Fingerprint security, it’s not just about being gimmicky, but it’s a speedy way to authenticate the owner and unlock the phone. Without it, you would need to enter a string of numbers, characters, or not having password protection at all. And did I mention that the recognition works rather fast? Standard micro-USB and mini-HDMI ports, which means you can use generic cables to connect. Built-in 16GB user memory, plus another microSD card slot for you to hold all your data that you need. 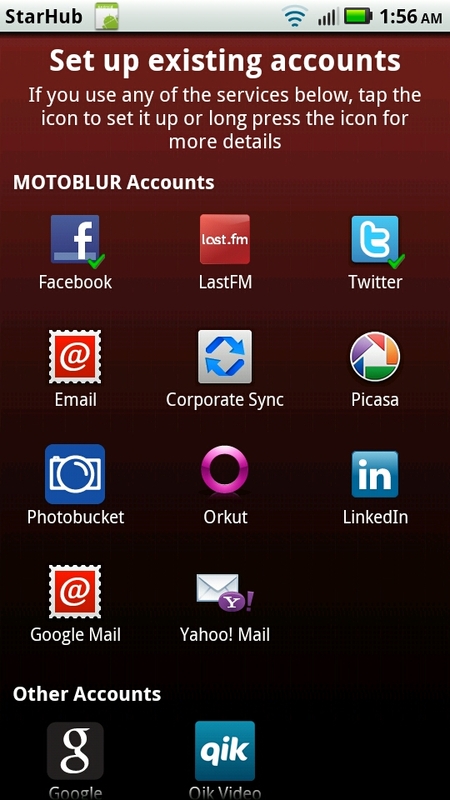 Setting up accounts is easy with MOTOBLUR. MOTOBLUR, the customised launcher for Motorola phones like ATRIX, has some useful customisation. 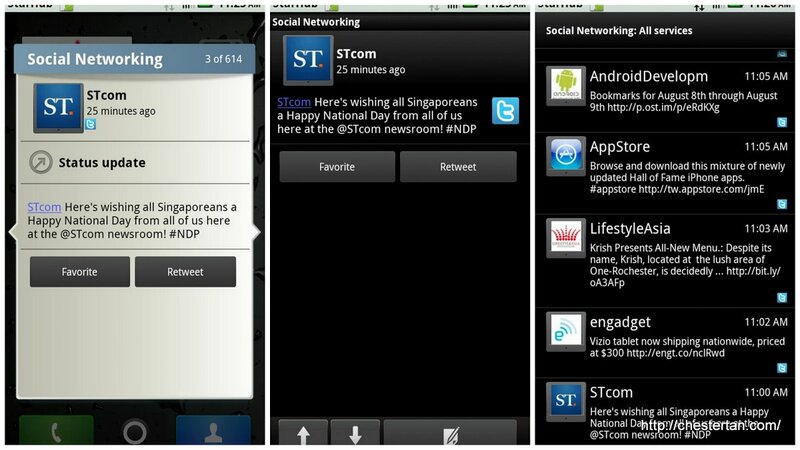 I like how they integrate all your social feeds and messages and display on the resizable and interactive widgets. Tap on it and the widget expands within the homescreen, allowing you to scroll the feeds or messages. Tap on the action button to either reply, comment, or view photos, and the appropriate app opens in full window. As a new user, registration to MOTOBLUR is straightforward and well-guided. Motorola also included a few extremely useful functions on the ATRIX. 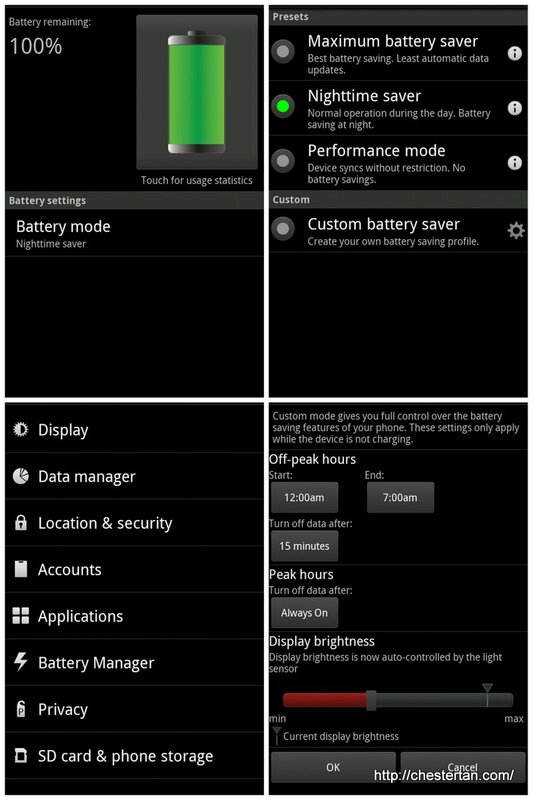 The Battery Manager app lets you manage how you can save battery during specified off-peak periods like night time. The Data Manager app gives you a glimpse of your data usage and lets you control how frequent you want to use up your data. The Phone Portal app allows you to connect via USB or Wi-Fi to your PC and manage your phone contacts, messaging, files, and settings. The ATRIX cannot unleash its full potential without the Lapdock or the HD Multimedia Dock. Sporting similar design and material as XOOM, the lapdock has a 11.6-inch screen that displays 1366×768. When you dock the ATRIX and open the lapdock, the Webtop app in the ATRIX starts up and displays on the screen. This app is like a virtual OS that lets you access the Internet using the Firefox browser. You can install Firefox extensions and add-ons, surf any website that Firefox already supports. On the Webtop, the ATRIX phone interface appears as a separate window, which shows you the exact view of the ATRIX phone, even allowing you to rotate the orientation. When you click a web link on the phone view, you will be prompted to open the link either on the phone view or on the Webtop. When you try to open a file that only the phone supports (e.g. MS Powerpoint), the app will start on the phone view (e.g. QuickOffice), which you can expand on the lapdock for a full window view. The brain behind the machine. Unfortunately, you cannot navigate the phone view like an Android tablet. The trackpad does not support multi-touch gestures, so you have to use mouse clicks to “swipe” the screens or select the items. The trackpad buttons aren’t exactly easy to use either: I find them too narrow and tight. For that, I would recommend plugging an external mouse to ease the pain. The interface allows for some customisation. The keyboard, trackpad and mouse sensitivity can be adjusted, you can configure printers within the network to use with the ATRIX lapdock, just like a netbook. I actually find myself using the ATRIX lapdock frequently during my review as it offers similar usage experience as a netbook. The keyboard is also comfortable to type, with plenty of room for resting the wrists. Webtop is laggy. And since there is no hard-disk noise or lights, you were left to wonder if the Webtop is processing your click. Each USB port can only support one storage device, so when you plug a USB hub, you can only mount the first storage device. Poor audio quality that lacks clarity. Good only for casual listening. The lapdock does not have low-battery warning indicator. When the battery is exhausted, the lapdock screen will suddenly go blank. It came as a shock while I was working on a blog entry, but I realised that the ATRIX phone of which the Webtop is running on is keeping the session alive. All I needed was to plug the lapdock on AC power and my Webtop session sprung back to life. Pity that the ATRIX is unable to power up the Webtop. The Webtop session closes when you close down the lapdock screen. When you open up the screen, it would take a few moments for the Webtop session to resume. When docked and running Entertainment Centre app, the ATRIX shows a remote control display to navigate the screen. The other dock, the HD Multimedia dock, can also run Webtop, provided you plug AC power to the dock. The Webtop will appear on your HDMI display that you plug the dock to, for instance, HDTV. Without AC power, the Entertainment Centre app will appear on the screen. The USB ports behind the HD dock will also not work without AC power. Mini HDMI, 3 USB, AC plug, and audio-out ports on the HD Multimedia Dock. Since the Webtop app looks identical to what you see on the lapdock, I will touch on the Entertainment Centre app here. It allows user to easily select music, photos and videos for viewing on the big screen. The display is clean and uncluttered, with transition animations when you make a selection. You can play a photo slideshow and select music tracks from your ATRIX at the same time. Sad to say, the video section fails to play any of the reference video files I stored in the ATRIX. These unplayable video files consist of sample of video samples encoded in MP4, DivX and MKV formats. So make sure that your media formats are within the specifications of the ATRIX (AAC, H.264, MP3, MPEG-4, WMA9, eAAC+, AMR NB, AAC+), in order to play on the Entertainment Centre app. When unplugged, the HD dock can also be useful as a stand (albeit an expensive one) to prop-up the ATRIX so that I can do some content browsing or typing using a wireless keyboard. The Motorola ATRIX with lapdock offers the ability to access the web over a netbook-like form factor and interface. If you do not have a netbook and you want the ease of surfing the Internet on a large screen instead of the small phone screen, then the ATRIX will give you that convenience. While the battery capacity is the largest among the Android smartphones, I do not see any exceptional gain in battery life. At launch, ATRIX runs on Android 2.2 Froyo. The HD Multimedia Dock, when plugged in to AC power, gives you the same capability as the lapdock, but delivered over HDTV. You would need a separate keyboard and mouse to make the set-up complete. Sad to say, the ATRIX does not mirror the screen output to HDMI devices, thus limits the potential of the HDMI output. I am also disappointed that the charging ports for the devices are all different, and that means the chargers are not inter-compatible. But I like the convergence of a smartphone and a netbook or even the multimedia TV. No longer do I need to share or sync files and web bookmarks over multiple devices. The ATRIX becomes the master of your data, giving you ease of access and a familiar browser experience when inserted to the various docks. Motorola has taken the first bold step of convergence, and I believe many will follow and improve on this idea on future devices.